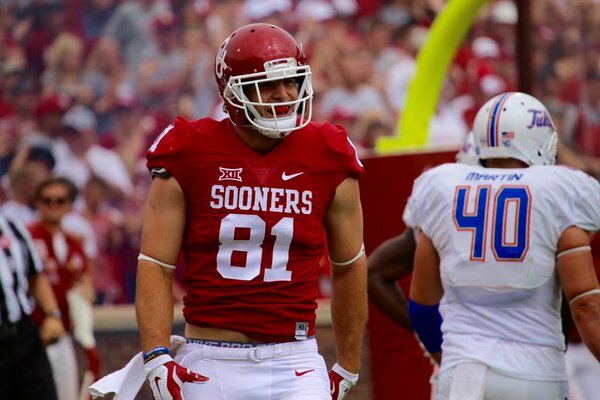 A new year brings new opportunities, and for OU redshirt sophomore Mark Andrews, a new year brings an expanded role in the Sooners’ offense. After totaling 19 catches for 318 yards in his first year as a starter, Andrews himself admits he’ll have a bigger impact from the tight end position this fall. For most of last season Andrews was a reliable pass catcher for quarterback Baker Mayfield, and earned his trust to the tune of scoring seven touchdowns, which ranked second on the team behind only Sterling Shepard. But with Shepard now gone and playing for the New York Giants, Andrews is confident his number will be called upon more often.